Image courtesy of Wikipedia. When the first concrete football stadium in the country was being constructed on the storied Cambridge campus of Harvard University in 1903, sportswriters of the day considered it sacred ground. "During a blistery Sunday afternoon, 22 men took the field, gladiators preparing to do battle in front of a roaring crowd of spectators, all for a fleeting chance at glory." Football fans have heard similar, grandiose descriptions of the game for decades, comparing the players of yesterday and today to the warriors of antiquity. Any fan reading that line may have instantly switched into the steely baritone of an NFL Films announcer, perhaps adding the crackling of tackles and the boom of timpani drums as part of a subconscious soundtrack. Gladiators and football players: it's a common comparison. And, when looking at the dawn of the sport, a somewhat apt one. 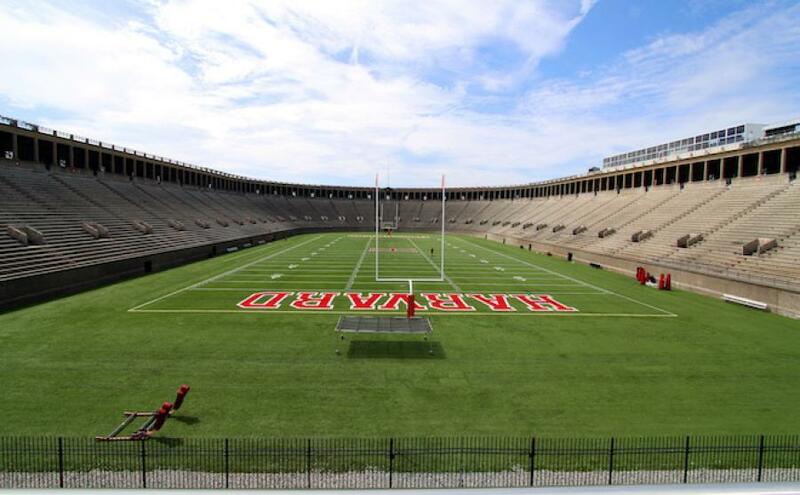 When the first concrete football stadium in the country was being constructed on the storied Cambridge campus of Harvard University in 1903, sportswriters of the day considered it sacred ground, and believed the U-shaped structure would "rival those buildings in the ancient world solely given up to athletic games." Constantly compared to the old stadium in Athens—the school's drama department would even stage Greek plays inside its grand confines—the stadium helped reinforce Harvard football as one of the era's preeminent programs. From the early days of the sport, when football resembled what one writer called "a cross between rugby, soccer, and a bar fight," this massive edifice and forward-thinking structure helped elevate the competition, making a comparison to classical competitions all the more relevant. It also literally altered how we play the game. Built in 1903, Harvard Stadium was the first freestanding concrete stadium in the country, and the one of the first specifically designed to accommodate the uniquely American sport (Franklin Field, a wooden stadium used by the University of Pennsylvania beginning in 1895, added more permanent grandstands between 1903 and 1905). The Crimson, the proud nickname of Harvard athletics, had been associated with many football firsts: the first intercollegiate football conference (1875, with Yale, Columbia, and Princeton), the first interregional game (versus Michigan in 1881), and arguably the first ever college game versus Montreal's McGill university in 1874, a 3-0 Harvard victory. But the construction of Harvard Stadium, which, according to a New York Times article announcing the plans, would be even more noteworthy, a structure with "football gridirons," the likes of which "is to be found only in a few of the ancient cities of Greece and Italy."